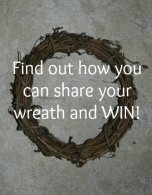 YES, I won this fabric wreath in a drawing held at the preschool where I used to teach. Each year our school held a fall festival for the community and all the proceeds go to the Children's Miracle Network. One of the biggest excitements was the drawing held at the end of the evening. There was well over one hundred items that were donated by just about everyone and local businesses. Not only did I win this, but it was made and donated by my very dear friend. Now, that is a Win Win! I have been blessed to hang it in my home every Christmas and have received many compliments. Terry made this from small squares of Christmas material, punched into a straw form. 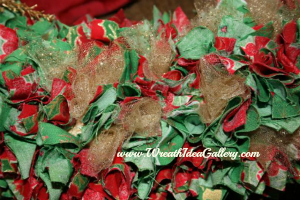 She used three different materials; a red Christmas print, a green Christmas print and gold tulle with sparkles. You really do not see the print however it adds a lot of texture to the end product. 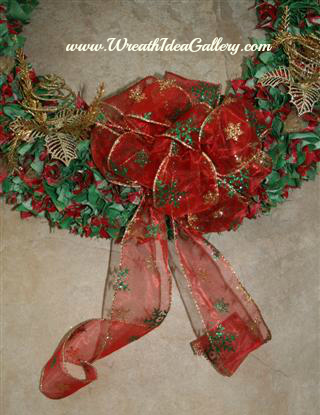 A beautiful bow made with a red, green, and gold Christmas ribbon is the center focal piece. Look for wire edge ribbon. There is a wire edge in this ribbon; so you can shape it to making it three dimensional. 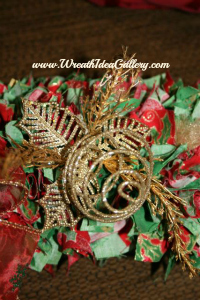 She added two gold accent pieces to each side of the bow this adds texture and sparkle. Thank You Terry, for the beautiful wreath and the memories to go with it. 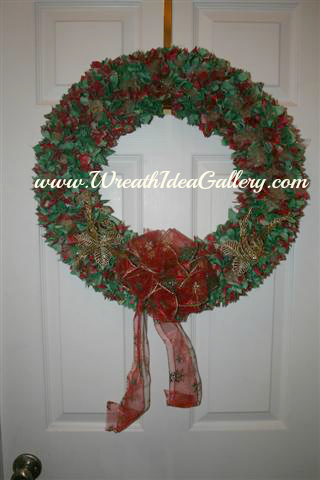 Easy punch fabric wreath directions if you would like to make your own wreath for yourself or as a gift. Great for any occasion, changing the material gives it a whole new look. 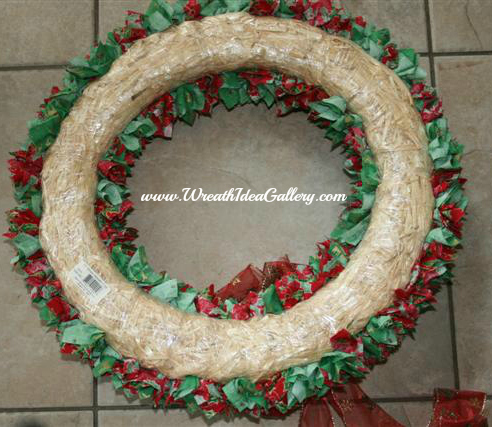 Check out these other material wreaths for other occasions. Because it is made of material it makes a good indoor decoration great for any interior door or over a bed or above the fireplace mantle.